I collect stamps from all over the world ... mainly used stamps. My collection keeps growing. I kept running out of album space so eventually I moved all of my stamps to the Scott International series of stamp albums, which was the biggest worldwide stamps album set that I could find. It is usually big enough now but sometimes I still have to make new pages. The collection spans 30 volumes ... at least I don't run out of album space anymore. One of my more interesting stamps is shown on the right. 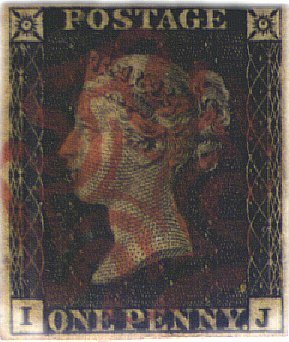 The penny black (Scott #1) was made in 1840 and it is the world's first postage stamp. It is living proof that the postage stamps was actually invented in Britain. My copy is used and lightly cancelled. The margins are tight but they are straight and full with no cuts into the design. On the whole it is a pretty nice stamp. I have had it for quite a long time now (about 35 years). Still, the stamp was already 135 years old when I first got it. Do you think the person who soaked this new novelty item off a letter long long ago (one of the world's first stamp collectors no doubt) had any idea of what they were starting? One of my most unusual complete mint sets is also a complete country set. Shown below are Scott 1, 2 and 3 from the former British Protectorate Ionian Islands. They were made in 1859 and they are the only stamps ever issued by this Protectorate. They are quite rare used, but my set is mint (with original gum, but hinged). My set has been certified genuine by J. & H. Stolow and all three stamps have complete margins.